Our Apartementhouse Lafenthaler is located amidst the impressive scenery of the Gastein Mountain Range and offering you a cosy and comfortable holidayhome. 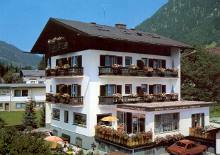 In a few minutes walking distance you reach the ALPEN Therme (big spa and indoor pool center), the conference center, the tourist office and all the nice shops in the pedestrian area of Bad Hofgastein. The close location to the valleystation of the Schlo?alm mountain railway and the woods is a perfect starting point for all your undertakings.